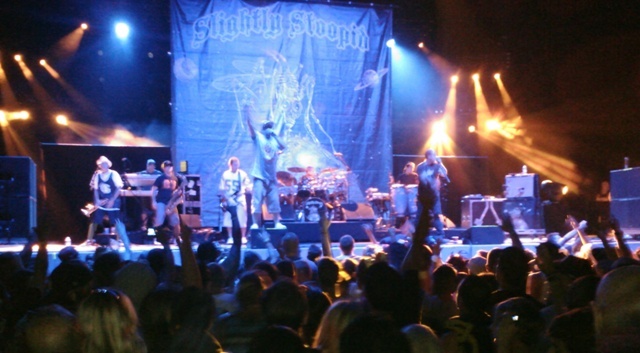 Slightly Stoopid performs Aug. 25th. All photos by Mercy Baron. Ah, the sweet smell of ganja is in the air, I must be at a 311 and Slightly Stoopid concert. On Saturday, August 25, these two bands came to play at the Cricket Wireless Amphitheater. 311 Ska rockers returned for the third year in a row that I’ve seen them there, and OB homeboys made good, Slightly Stoopid opened for them. Omaha, Nebraska musicians, 311 is my favorite band, and after having seen them at least 20 times in concert since they released their first CD, Music in 1993, I feel pretty confident in saying that this was one of their more lackluster performances. It wasn’t that I, or my fellow Hive (Their official fan club) members didn’t enjoy them, they still had us nodding our heads in time to the music, but they seemed a bit bored by it all. 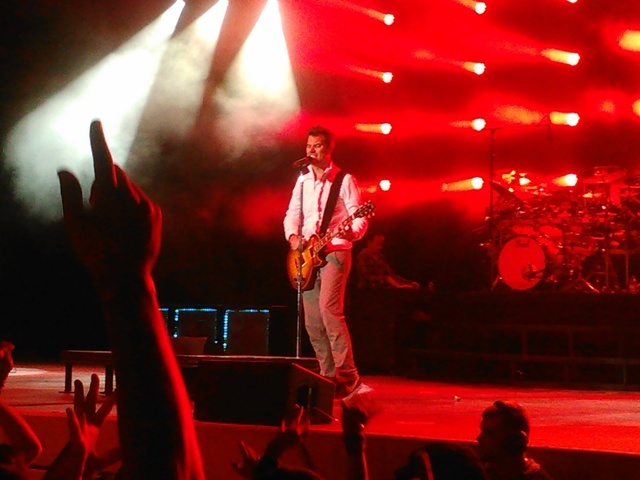 Their lead singer Nick Hexum, looked like he was just going through the motions and actually rolled his eyes during and after several songs. Of course there could have been something going on behind the scenes unbeknownst to us, or maybe it was because this was the closest I’ve ever been to them on stage, having bought tickets for The Pit. Yes, The Pit. When one hears about being in The Pit, shades of moshing, and pogoing come to mind for most of us familiar with those old scenes, mostly at punk rock concerts back in the day. While I never participated in the actual physical pushing and shoving, I always loved to observe it when I would go see bands like, Bad Religion, Fear, The Germs, etc in Hollywood. From upstairs at my old haunts, The Starwood and The Whiskey A Go Go, I would look down at the stage and The Pit in front and see much craziness. it was quite exciting. As I get a bit older, standing for this many hours wasn’t what I would normally like, but for my boys it was worth it. 311’s music doesn’t really lend itself to that tangling of bodies, but that might be due to the amount of da herb being passed around pretty much everywhere. I always think it’s funny how guys get patted down and practically molested by security going in the gate, but women just get a cursory search of their purse. They don’t probe too much, so it’s quite easy to bring in your stash. And seeing these bands stoned, well it’s sort of de rigueur you could say. It just adds to the fun of the whole experience. I’m not shy to say I participate in this, now I just do it legally! Security inside turns a blind eye to it all. 311 drummer Chad Sexton with Mercy Baron. Drummer, Chad Sexton always does a solo that even haters of the drum solo get pretty worked up over. He is just a master technician. Being a drummer myself, it was a great thrill to meet him a few years back at his drum shop in North Hollywood. 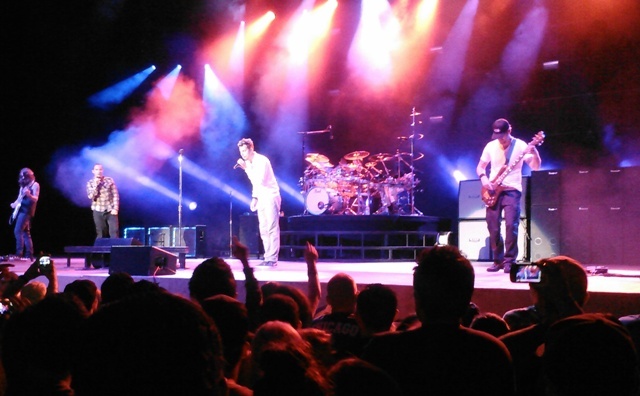 311 also offers their fans a Caribbean Cruise and a 311 Day every year, where the band plays multiple shows and interacts closely with about 3,000 of their fans. I don’t know of any other band that does this for their fans. All info can be found here. 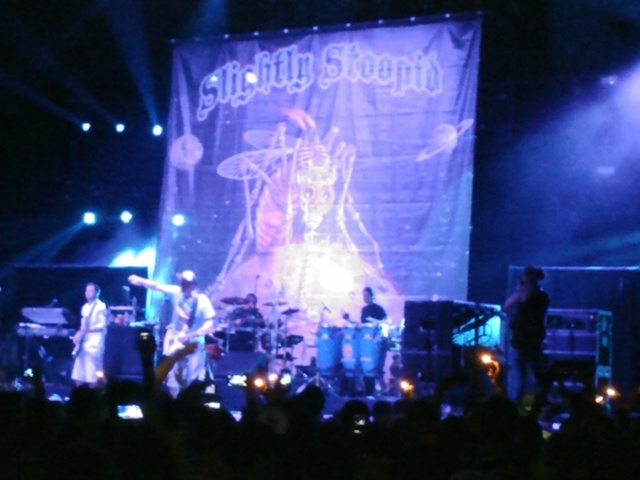 Local boys, Slightly Stoopid were rocking the dump with their brand of laid back Ska and in support of their 2012 release and 7th CD, Top Of The World, which, just like 311, debuted at #7 on the Billboard’s Top 200 Album Chart. Not bad for our Ocean Beach bad boys who had a chart topping hit with the song “2 AM” back in 2007. That song is still getting a lot of airplay to this day. Stoopid has been around as long as 311, so it’s nice to hear that they are having their day in the sun too. Band members Miles Doughty and Kyle McDonald were still attending Point Loma High School in 1995 when they caught the attention of Sublime singer Bradley Nowell, (since deceased) who signed them to his own Skunk Records label and released their first two CDs. Miles showed local pride and props by wearing late Charger’s, Jr. Seau’s jersey during the show. I heard from the friend who was at this show with me that many in the crowd only came to see Slightly Stoopid and I guess it was true, when my friends left after only 4 songs by 311. I tried not to be offended, their loss! Here’s their web site. A beautiful end of summer concert was just the right thing for this Obcean. The sound for 311 seemed a bit off, mic levels just didn’t seem right or yeah they just weren’t into it. Saw them at least 3 times before and this was definitely a lackluster show. Slightly Stoopid rocked it though and were loud with great sound. You know Matt, being as up close as I was…great visually, but the sound was mushy. I see you also thought it was not one of their best shows. Stoopid was sick though, right? yah stoopid tore it up for sure! Great review of the bands performance, also dig the info surrounding the concert experience. Smart phone photos? Very good. Yep Stephen, my new smart phone takes almost as good of pics as my regular camera. I’m very happy with them, thanks. Nice recap and pictures! — I definitely wanted to be there! Haven’t seen 311 in years, too bad they didn’t bring it full-force. But who knew they gave their fans cruises!? Pretty cool. And while local heros, Slightly Stoopid can be a little redundant on the airwaves in SoCal, I imagine a live show would rock and definitely wouldn’t leave before they played. What’s next on your concert calendar? Thanks Ameekins. Not sure what’s next on my concert calendar. But for sure you’ll hear about it on The Rag! Nice write-up! I must admit I’m not familiar with 311, but now I’m inspired to check them out and see how they are as compared to, e.g., The English Beat and Madness. Thanks!